Last summer I was able to take my family on a FREE summer vacation on the Oregon Coast, How I took my family on vacation for FREE! We had a wonderful time. The kids played on the beach for hours and never got bored, it was fantastic! After our summer vacation last August on the Oregon Coast, I decided that I would start saving my online earnings again for the same exact thing... a summer beach vacation on the Oregon Coast. I'm happy to share that I just paid for our 10 nights at a beach house with my online earnings! That's one major expense already paid for and out of the way! WOW, now I'm so excited and already looking forward to our summer family vacation! ☆ ƒåitĥ ☆ and her family are going to come over for a weekend again, so we can spend it together. This will be the 3rd year in a row that our families have gotten together for summer vacation! I'm really looking forward to spending the time with them again this year, they are wonderful! One step closer to vacation, I can almost feel the sand between my toes! SuperPoints for Super FREE Prizes! I know that there is an abundance of rewards programs out there, many pay and many don't. It's all about finding out which ones are legit and which ones aren't. I can assure you that all of the websites that I talk about on my blog are LEGIT! I'm not going to waste my time on those that aren't and I'm going to share my experiences both positive and negative with all my friends, so you know which ones work and which ones aren't worth it! The SuperPoints Network is a collection of sites where you can win and earn SuperPoints™ that can be redeemed for great rewards. I choose the Amazon.com gift cards and "bank" them for Christmas gifts! Take a look at all the great sites in the Super Points Network, and find out how you can get big rewards by searching, shopping, or recruiting. I've been a member of Pinecone Research for a few years now and I really enjoy it. I get paid to take simple surveys and have received many great FREE samples to try out as well! Well, I was at Kohl's and noticed that some of the frames were 70% - 80% off. 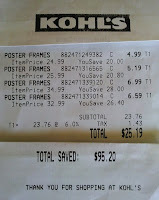 I ended up getting 4 frames (10x13 and 11x14) for just $25.19. Which was the price of 1 orignally prices photo album! Earning money and winning prizes is something I look forward to each and every month! It provides me with a little something "extra" for my family! I'm all about the simple things, they are what matter most! We usually just have a nice dinner at home, no crowds and long lines to wait in. It's about the quality time, not the money spent! What do you and your significant other do for Valentine's Day? How about something a little sweet and a little healthy... HANDMADE CHOCOLATE DIPPED STRAWBERRIES. It's something that can easily be done at home for a fraction of what it costs to purchase them at a chocolate store. ANYTHING dipped in chocolate would be just as perfect, pick their favorite. How about something from the heart... HANDMADE CARD. You can be very creative, let your heart lead the way! Glitter adds the perfect touch! Something that my husband and I have done in the past are LETTERS to one another. I have all of mine saved in a special envelope, I love to read them from time to time. How about a CD with songs that have special meaning, songs that you both like and songs that are favorites. Or just do one with all romantic songs! How about a nice MASSAGE in the comfort of your own bedroom. Set the mood with soft music and candles. Maybe even add some of those chocolate dipped strawberries and whip cream! I was recently chosen to host a Sandwich Thins Sandwich Revolution House Party. I'm going to be receiving a wonderful party pack that includes supplies to hose an incredible House Party for my friends. I'll be getting coupons for FREE Sandwich Thins, reusable grocery bags, shopping lists, more coupons and recipe cards! I've been fortunate enough to host a variety of House Parties in the past: Star Wars Clone Wars, TNT Trust Me, South Beach Diet, Your Shape and Sandwich Thins just to name a few. There is always a variety of House Parties to apply for. Not only is it easy but it's TOTALLY FREE. It's free to join and become a member and it's free to host a House Party that you are chosen for. It couldn't be more simple. You join, sign up and if chosen plan your House party. Are you a member of House Party?